The Báb Bahá'u'lláh - Born Siyyid `Alí Muḥammad Shírází, the Báb was the founder of Bábism, and one of three central figures of the Bahá'í Faith. He was a merchant from Shíráz, Persia. On May 23, 1844, in Shiraz, Persia, a young man known as the Báb announced the imminent appearance of the Messenger of God awaited by all the peoples of the world. 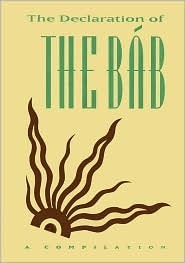 The title Báb means "the Gate." Although Himself the bearer of an independent revelation from God, the Báb declared that His purpose was to prepare mankind for this advent.Swift and savage persecution at the hands of the dominant Muslim clergy followed this announcement. The Báb was arrested, beaten, imprisoned, and finally on July 9, 1850 was executed in the public square of the city of Tabriz. Some 20,000 of His followers perished in a series of massacres throughout Persia. Today, the majestic building with the golden dome, overlooking the Bay of Haifa, Israel, and set amidst beautiful gardens, is the Shrine where the Báb's earthly remains are entombed.